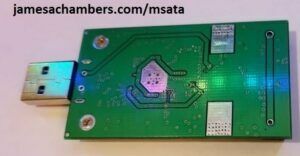 Since the M.2 NVME form factor has won the high performance solid state drive war many of you may be stuck with older micro SATA (mSATA) drives. These still have a very awesome use that will only cost you $10 to take advantage of. A blistering USB flash drive can be created out of them instead of throw them away! 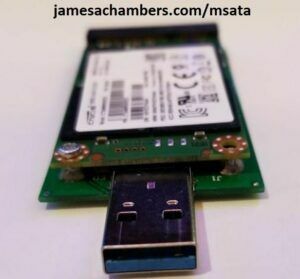 Despite mSATA falling out of favor these drives still far outperform any USB flash drive you will come across. They absolutely destroy my Sandisk Extreme USB drive. The advantages of these drives being classified as “fixed disks” enable many performance enhancements that are not applied to traditional “removable storage”. These include write-caching, trim, dedicated memory buffers, and many more! Build your own supercharged portable SSD today with yesterdays technology! Hey! Thanks for all the great info. I went big with the mSATA drive and USB connector, and I’m running into (apparently common) problems getting it recognized. When I insert it into my PC, it does not appear as a letter drive. Disk Management sees it as uninitialized, but cannot initialize it. Device manager sees it only as an SATA interface (?). I can eject it as removable media. Any idea what’s going on? If I can’t initialize it, I can’t format it, and my daughter doesn’t get an Oreserver. In the past when I’ve had drives having trouble being recognized I have ran the diskpart clean utility on it. Try going into a command prompt and typing diskpart. This should open another window. Type list disk and see if you can see your solid state disk in there. If you see it press select disk #. Be extra careful and make sure that it is not your main hard disk or anything like that. Now type Clean. After the operation completes go back to the disk management tool and see if you can initialize the drive. You should then get the option to format the drive and give it a assigned drive letter. If this fails can you post the exact model of adapter that you bought? The disk is a Toshiba THNSNJ128GMCT. The adapter is generic, it is stamped NFHK N-30U V1. FYI, one ad for the adapter cautioned that it would only work with drives with the Intel pinout. I only found a reference to Intel drives being unique in one other obscure place, it is not something that is mentioned in specs.